(Recap with Spoilers) Outlander S4E2: "Do No Harm"
Before watching the newest episode of Outlander, I had already read some Tweets about the second episode of this season. I knew that in this episode the storyline would revolve around black enslaved characters. While of course this series ultimately follows the story of time traveler Claire Fraser, I was not disappointed by the attention paid to the experience of enslaved black persons. 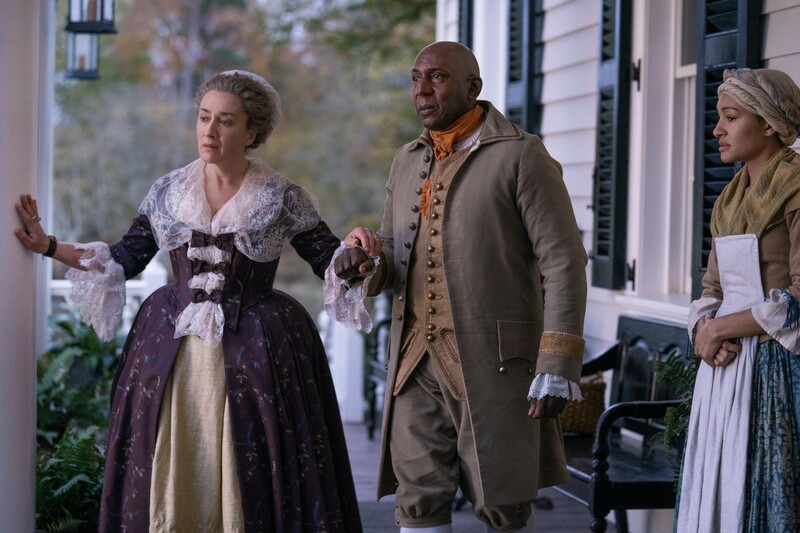 While the episode was gruesome and upsetting, I appreciated ‘Do No Harm’ for showing what life was like for enslaved persons in 18th century America. The episode starts with an enslaved woman winding up the clock for the day. I liked this included detail as it shows just how many tasks slaves were responsible for. Oftentimes media covers the field work that slaves were used for, but not the numerous other tasks they fulfilled to enable their owners’ lives of ease. 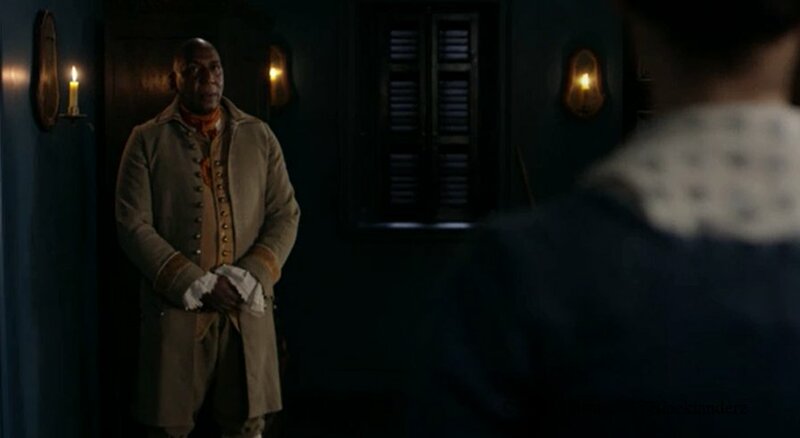 In this episode we meet both Ulysses (Colin McFarlane) and Phaedre (Natalie Simpson) , some of the most awaited black characters from the Outlander book series. From the start we see Ulysses protectively walking Mistress Jocasta down the stairs, he stands behind her as she greets her guest. We later find out that she is blind and Ulysses’ is essentially her eyes. One of the most ironic lines from the episode comes from Mistress Jocasta owner of 152 slaves: “We will show you some River Run hospitality.” The episode quickly shows that this hospitality was not extended to all people. Correctly portraying the ideals of many slave owners Mistress Jocasta believes in "benevolent" ownership. As Phadre is working on her dress (at her feet no less) Claire professes her stance as an abolitionist. At her dinner party she makes Jamie her heir and therefore the owner and operator of the plantation. This raises the question: How will Claire and Jaime stay true to their anti-slavery beliefs? They decide that they will simply give all of the enslaved people on the plantation their freedom. However, they are quickly shot down after finding out that the law of the land was the greatest obstacle to freeing the slaves. They would have to pay up to 100 pounds for each slave to be freed as well as gain approval from the government. Later on a slave named Rufus injuries a white man. This of course is against the law and means he should be put to death. Claire and Jamie refuse taking him back to the plantation. Claire sews up his injuries and much to his shock begins talking with him. Melancholy music plays in the background as Rufus tells Claire of his native country Adjumako, Africa where he and his sister Abena were kidnapped from as children. Claire thinks she can save Rufus. Ulysses however tells Claire that by not allowing Rufus to die on the hook she has only caused more trouble for the other slaves. Life will be made much harder for the other slaves if Rufus is not turned over. I was worried that they would have Claire give him some big speech. But no, she was left there to think about how her actions put others in danger. Moments later an angry mob hungry for “justice” comes to the house. Threatening violence if Rufus is not turned over. Claire and Jaime try to stall, but at the end of it all Claire gives Rufus a merciful death with poison as opposed to a painful one at the hands of the mob. There is no last-minute save. His lifeless body is dragged away and promptly hanged. Outlander refuses to pull any punches. I am interested to see how the rest of the season plays out.